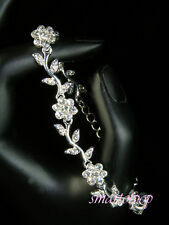 Bri desmaid Crystal Flowers Silver Plated Bracelet / Bridal / Prom -187. Simulated Diamond Flowers Bracelet / Bridal / Prom brss-187. 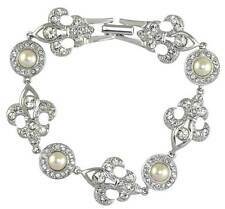 This bracelet is prefect for wedding, parties or any special occasions. Colour : Clear crystal with silver plated. Multi 9ct 9K " Gold Filled " made with Swarovski Crystal Earring Xmas Gift E624. Get Images that. Make Supersized Seem Small. Finish: Fine & Shining of High Quality. Christmas Personalised Bracelets for Girls, Any Name, Gift for Christmas. These beads are just under 2mm in size so gives an elegant dainty look. A pretty pink, pearly white & silver stacking bracelet with Miyuki Delica seed beads for this easy to wear fashion bracelet gift. This high quality antique silver plated sparkly heart bracelet features a braided link band with a decorative lobster claw clasp. The heart charm is accented with 32 rhinestone gemstones. 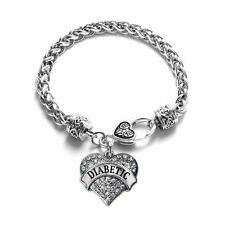 Would make a lovely gift for a diabetic. Simple and pretty this pale blue Oval Cabochon Bangle is set with a smooth polished lace affect A gate crystal gemstone. This elegant jewellery accessory has a flexible silver plated open clasp making it very easy to fit. Silver Plated Bracelet. For sale is a Silver Plated Bracelet. Made with Tiny 4mm Round Beads. The Beads are hollow and Silver Plated. The Bracelet is made with a. There may be a delay in replying but I will get back to you. 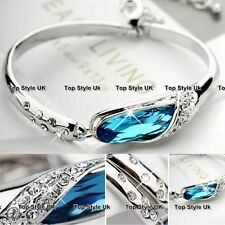 Material: silver plated, Crystal Zirconia. Dark Red, Coral Pink & Pearly White Seed Bead Skinny Fashion Bracelet. This bracelet is 7.75" in length & I can make to any size you like, or maybe an anklet. I used high quality Miyuki Delica seed beads f or this uniquely designed layering bracelet. Made with 6mm Round Beads. 6mm Rhinestone Roundelle's. Silver Plated Heart Bracelet. For sale is a Silver Plated Bracelet. The Beads are hollow and Silver Plated. The Bracelet is made with a. 18mm Puffed Heart. I only use high quality seed beads so that your bracelet is uniform in size. This bracelet would look great worn on its own or with other bracelets, or why not create a boho style by layering a few of these together. Blue & White Surfer Stacking Fashion Bracelet. I chose a mix of tiny 2mm high quality Miyuki Delica seed beads for this handmade layering style fashion bracelet.